Also a complete song written to measure belongs to the (successful!) Possibilities. The repertoire includes 18th-century Italian songs as Mozart, Puccini and Bizet but also 30 evergreens. 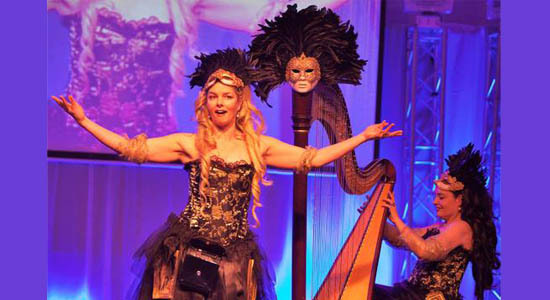 A fiery Carmenaria, a love letter program about Mozart, Venetian Carnival with golden confetti or Kerstengel act. All beloved Christmas songs are over. 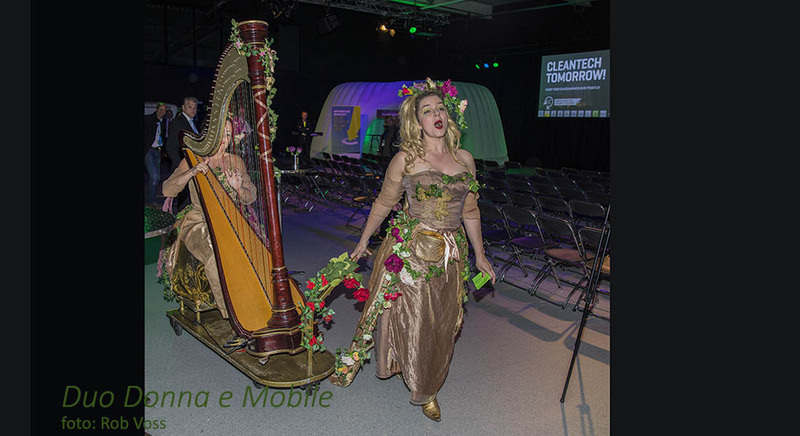 A program with customized texts … Donna e Mobile can also bring a flowery version of the beautiful Aria Antiche, Neapolitan and Venetian songs and arias of Mozart and Puccini in which the interaction with the audience plays a major role. Do not hesitate to ask about the possibilities at Buro van Otterloo. 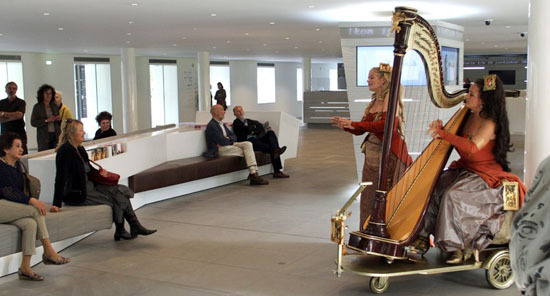 Duo Donna e Mobile can, depending on the circumstances, move between the audience with the self-designed and unique ‘harpobile’: a charming riding ‘harp-cart’ on which the harpist sits and is pulled through the soprano. 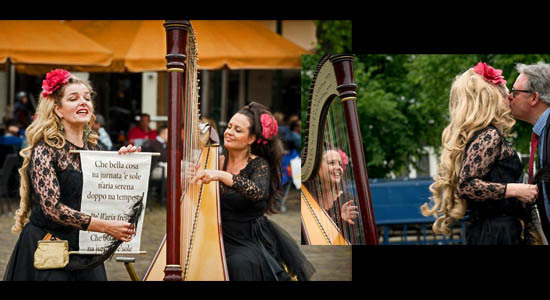 This harp-soprano duo can make a surprising entrance or musical tour while playing and singing. Donna e Mobile also provides tailor-made services and a Custom made song for, for example, the departure of a director or employee or bringing the new strategy of your company in a stylish, musical way. 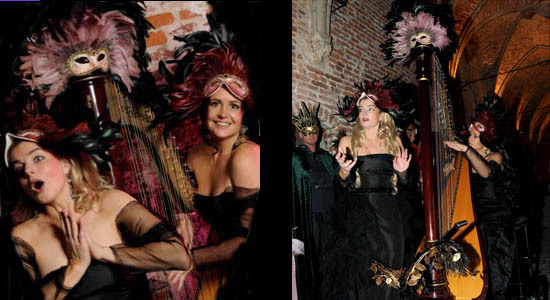 In addition, various specials of this truly phenomenal harp-soprano duo are possible, such as performances in the theme Bal Masqué (Venetian theme party), Christmas (Christmas performance act). 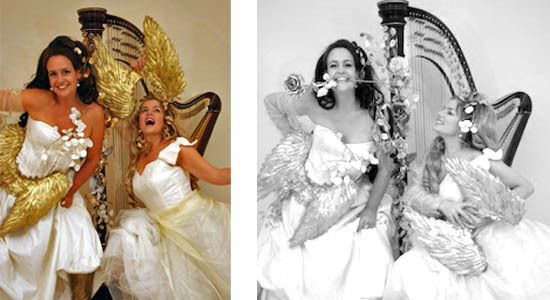 Clothing of choice in theme of event: this playful classical harp-soprano duo can perform in beautiful dresses from floral baroque, theatrical gala, passionate red, obliging black and white to fairytale gold or completely casual of course. The duo welcomes a cappella guests at the entrance (15 min.) They can fulfill a logistical function by pointing the guests in the right direction), solo harp during dinner (when guests enter the dinner hall), and 2 intermezzi of 5-25 minutes of your choice. 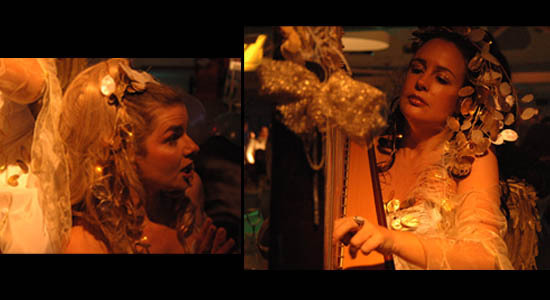 Unique and memorable is the performance of Donna e Mobile with a personal aubade, a song specially written for the occasion, in which a moment or person is put in the spotlight. For example a jubilee, a director who leaves or a birthday! Sopraan Maaike is een zeer originele en uitstekende tekstschrijfster in zowel het Nederlands als het Engels. Na het toegestuurd krijgen van achtergrondinformatie over uw bedrijf, scheidend directeur, jarige etc. en eventueel een telefonisch interview, schrijft zij een stijlvol lied op maat met inhoud én humor! Zie onderstaande video als voorbeeld van zo’n lied op maat voor de Gemeenteraad van de Toekomst in de Balzaal van Paleis Kneuterdijk te Den Haag in aanwezigheid van met vele prominenten. This exclusive special from Donna e Mobile is ideal for Italian, or more specifically the Venetian, parties. In their Venetian act, this duo brings authentic repertoire from Venice with their beautiful matching costumes. Especially for the days around Christmas, duo Donna e Mobile has the Christmas angel act consisting of English Christmas music, Italian songs full of romance or French melancholy. Duo Donna e Mobile presents with a stylish and theatrical program, light in the dark days. Posibilities are: an intimate intermezzo during dinner, a mobile performance during larger receptions, a fairytale reception or a passionate serenade.